Hipower system offers an extensive line of towable diesel generator sets manufactured for reliability under virtually any operating conditions. Generator rentals are increasingly in demand for everything from standby power during storm season to temporary power for plant turnarounds. These rentals often undergo much rougher treatment than end-user purchases and must be well-built and durable. Yet, they must also offer sufficient operating flexibility to satisfy the diverse needs of rental customers. At HIPOWER SYSTEMS, we engineer our rental generators specifically to provide long and efficient operating life and superior performance under these exacting conditions. These rugged, waterproof units support the widest possible range of operations to ensure maximum productivity and revenues for the rental firm. To learn more about the features and characteristics of our rental generators, we invite you to review the details below or visit the individual model pages on this site. To have one of our specialists develop a custom recommendation for your company or customers, please submit a contact request form or call 786-348-2156. The growing demand for power generation, combined with unstable sources of power distribution in the U.S. and Canada, have already become prominent concerns within the oil and gas industries. Use of portable power equipment is now considered to be a key factor in cost-efficient and reliable power generation. Generator rentals, which have been a long-standing staple for construction projects, are increasingly becoming popular choices among energy companies. When choosing the most suitable generators for rent for a particular project, it is important to determine the scale and longevity of each venture. We advise our clients to consider purchasing products with certain value-added features. HIPOWER SYSTEMS is partnering with different rental companies to stay informed and updated on the latest market trends. 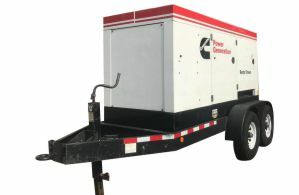 By knowing the preferences of our partners' clients, we are capable of providing custom generators for rent that meet the unique demands of each customer. As a result, we not only understand and address the needs of our target market; we also maintain our status as a leading developer of portable generators for rent and for sale. This is reflected through our unmatched number of Canadian Standards Organization-certified natural gas generators compared to our competitors. To maintain this level of product quality, we have adopted standard features for most of our portable generator rentals. Some of these include passing or exceeding NEC, MSHA, and OSHA standards; compliance with Tier 3 and Tier 4 criteria for NESHAP-regulated emissions; a set of systems for uninterrupted operations even during extreme temperatures (as low as -500F); environment-friendly designs; and parallel configuration support. For a more detailed and complete set of information about our generator rentals and other products, please feel free to browse our website. You may also contact us at 786-348-2156 for any inquiries.